FREE DELIVERY for local online orders. We take pride in our work, and stand behind every arrangement we deliver. If you are not completely satisfied with your order, please contact us so that we can make it right. We do not charge service fees! This means that by ordering your arrangement directly from us, you will automatically save money - no coupon codes or special deals required! 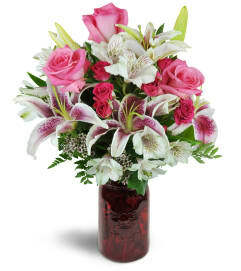 All arrangements purchased from us are professionally designed and hand-delivered. No wilted, sad, flowers in a box here! Your bouquet will be exquisitely arranged and ready to be enjoyed. Our customers are our top priority! When you buy from us, you know that you're working directly with a real, local florist. 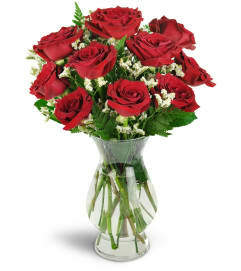 We will personally ensure that you're happy with your arrangement! We'll add additional coordinating items to your order, or upgrade the size. When do you need it? Order by for same-day pick up. Usher in Spring with a dash of charming romance! For a springtime anniversary or birthday, tulips are simply the perfect choice! Complementary shades of red, pink, and white tulips are arranged in a sophisticated rectangular glass vase for an ideal Spring gift! Delivered within three hours! Recipient loved the bouquet. Easy website. Great pricing. Same day delivery. Incredible aroma the minute you walk in. Indescribable would be an understatement in customer service you don't see that anymore in today's world. More companies Should have such value. Thank you for answering the phone before hours started this morning and then delivering my order on the same day just because you're you Laura. Ordered online for a family member. It was easy and so many options! My family member loved them. Whiting Flower Shoppe is a Lovingly Florist in Manchester Township. Buying local matters. Discover how Lovingly supports local florists. Copyrighted images herein are used with permission by Whiting Flower Shoppe. © 2019 Lovingly, LLC. All Rights Reserved. Lovingly and the Lovingly logo are trademarks of Lovingly, LLC.